(backposting) First, I wasn't feeling very well. And then we lost Internet access for about 9 hours. Gibber indeed. Most important day of the year? It's St Michael's day: the day that we celebrate St Michael and All Angels. What day could be more important? As it happens, I've been suffering from the lurgy: sore throat, headache, and even a little bit tearful when discussing the shopping list. That's pretty standard for the course when I get a bit ill: not really sure why. Moo's laughing didn't _really_ help, though I knew I was being silly. Still got lots of work done, though. Not the long-term future, but it looks like I'm going to be starting a project in Finland next week. It'll probably be for a month and a half, and I'm very pleased to discover that Miguel, a colleague, will be joining me. We'll probably do a week on site (in Finland), and then a week off, through the term of the project. It's going to be be interesting, and I'm glad it won't just be me on site. I discovered that St Mary Aldermary holds a Holy Communion service ("Mass") on Mondays, at lunchtime, and went along. It was a BCP service, with the priest (in dalmatic, rather than chasuble, I think), a sacristan/server (in cotta) at the front, and around 8 other people, including a nun. It was a lovely haven of quiet and peace in the middle of the day, and I'm very glad I made it. I'm usually in London on Mondays, and I'm going to try to make a habit of it. (backposting) So, the sermon. I'd done some more work on it last night, and written some notes. It went OK, but I find it more difficult to create a good narrative when I've got too many notes, and I'd let my nervousness get to me, which had encouraged me to write more notes than I'd intended. I'm also currently in a place where I'm trying to develop my sermon-writing, and need to move to a stage where I'm a little more confident in the things I'm learning. It's all good stuff, but it'll take a while. We headed home after the girls' supper. I was hoping for 3.5-4 hours max, but it was more like 5. Moo took the latter stages, which was very helpful. More friends and family needing prayers. My capacity for prayer is being stretched, but God is providing. (backposting) We decided the other day to buy the girls a bunkbed for Christmas, and today we told them about this. This is because Mum and Dad wanted to buy the girls something special, and they'd agreed that accoutrements for bunkbeds - mainly duvet, pillow and cushion sets. So the timing worked quite well. Went for a great walk in the afternoon - one of the ones I used to love from my childhood. Both girls did lots of running, which was pretty impressive. (backposting) Well, we used to be able to leave early on a Friday - assuming work commitments can be managed - to go to see friends or family. But these days Jojo's at school, and that's not an option. So we left after the girls' supper, and drove off down to my parents' in Somerset. Jo took rather a long time to get to sleep, though, so after interminable games of "I spy" (with various, interesting rule changes instigated by the younger player), I taught her the rudiments of algebra. "Let's pretend that letters are numbers. Let's pretend that "tuh" ("t") is 2, and that "ss" ("s") is 3. What's "tuh" add "ss"?" Jo then failed to add them up correctly on her fingers, but she certainly understood what was going on. I'm quite (no - very) impressed. And I wrote another sermon. I'm going to be preaching at St Andrew's, Cheddar, on Sunday, when my father will be taking the service. This is scary, and I wasn't happy about the one I had prepared, so I started a new one. And completed it, but I'm still a little worried. (backposting) It's been difficult this week. We've been fine, but a number of friends and family are having a bad time. Not things I can talk about, but my prayer life is being extended. It is, of course, never good to be in that position, but I think it's an important stage of my spiritual life. That shouldn't sound so strange: I'm grateful for the opportunity to be able to prayer for friends and family. (backposting) Last year, we had a "Beer and hymns" event at the Dog Inn in Halstead, and it went very well, so we did the same again today. I went along, and I made the mistake of volunteering to help play the keyboard, and ended up splitting the songs/hymns between us. Well, I mainly did the hymns, and Becka did the songs. We had a great time, and had lots of people there. Good to see Christians being non-stuffy. (backposting) Today I stood in for my boss, who wasn't able to take the 1900 Holy Communion. It was St Matthew's day yesterday, and as we'd not transferred it to Sunday, I thought it would be a good idea to celebrate it today, so rather than use an altar in one of the side chapels, I prepared the high altar, and although I didn't change the altar frontal to red, I vested in red stole and chasuble and got ready to take the service. I sat down to ready myself, and waited, but after 5 minutes noone had come. I certainly wasn't going to celebrate Holy Communion on my own (quite apart from not being at all happy about the theology, it's forbidden by canon law), so I took a service on ante-communion, going through all the Holy Communion until the beginning of the Eucharistic Prayer, and then stopping, finishing with the Grace. Just me. But I was very aware that I wasn't alone, but surrounded by the heavenly host. It was a fantastic experience. One of those occasions, I'm afraid, where I can't give any details, but just ask you to pray for two people who really need all the prayers they can get at the moment. Dear to me, both. 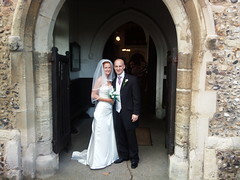 I took Vicky and Richard's wedding today, which was fantastic. I love taking weddings, though I've only done two to date. My main problem with them is that I have to work hard to control tears as the bride walks up the aisle! I do get a little emotional, it has to be said. It's really good how having children at school and pre-school starts integrating you better into the community. We need some insulation put in the roof (yes, I know I could technically do it, but I could also technically put my foot through several ceilings), so we got the dad of one of the other kids (who's a builder - the dad, not the kid) to come round and look at it. He was very helpful, pleasant, and seemed to know what he was talking about (there are some complicating factors, as we have a very old house). So we'll almost certainly get him to do the work. Oh, and it's so much nicer giving work to people in the local community. Good stuff. After the excitement of peering into our loft spaces (we have 3 different ones - see above about old houses), we took the girls swimming for about an hour and a half. They had a great time, and we were all very hungry afterwards, so headed down to one of our favourite local cafe-restaurants. They took 20 minutes to even take our order. And it took another 15 minutes for the first of our drinks to arrive (and that was after hassling), with the others arriving some 10 minutes later. Luckily we'd ordered some garlic bread (which came around the same time as the second set of drinks), and the girls were very, very patient. We ended up getting stuffed, and came back to "garden". Well, sit in the garden watching the girls putting on "Shows". You know the type: "Falling down show", "Bouncing Show", "Skipping Show", "Beach Show" (they stripped down to underwear and pranced around to music with pom-poms as microphones), "Rain Show" (they added umbrellas) and "Snow Show" (they pretended to shiver). I've got some of it on video, and intend to save it for when they have their first serious boyfriends. Oh, yes. (backposting) When I was young, I had a set of tapes of The Hobbit which I listened to again and again and again. I recently decided that Jo's probably just about old enough to enjoy it, in short snippets, so I ordered a copy, which arrived today, and have started reading it to her. In unrelated news, from time to time my sweet tooth gets the better of me. When this happens, I tend to go to the shop next door, buy a tinned syrup sponge, heat it up, add milk and _extra_ golden syrup, and eat the entire thing. I know that this will make me feel ill, and guess what: it did. I'm not proud of myself. (backposting) I have a great boss, John, and I'm very lucky and blessed. We had a great supervision tonight, first working through some administrative stuff - what services I'd be involved in, etc. - and then going through other issues. We discussed colleagues, the joys of presiding at Holy Communion - and other services - the importance of preaching, and tools and techniques to improve. That, and all the usual topics, of course, including women in ministry (we're both for: as a bishop once told me, "we ordain women because we baptise them") and homosexuality (I have no problem with homosexual clergy - or homosexuality, in fact). It was a really affirming meeting, and instead of finishing with the Grace, as we usually do, we finished with the Lord's Prayer, which is particularly important to me at the moment as both Miri and Jo are becoming well-acquainted with it. (backposting) Oh, we love Buffy. The Vampire Slayer, of course. We're watching the entire set of seasons on DVD, one after the other, and we got to the one in Season 2 where Cordy and Xander first get it together. What quality! In completely unrelated news, I Miri was absolutely gutted to discover that she wouldn't be going to pre-school till tomorrow. She's too young, really, to have much concept of time, and she loves it so much that I think we're going to have to increase the number of sessions she does pretty soon. (backposting) Downtrodden in two ways, really. The first was that work didn't go well today. Not that it went badly - it was just that all the things I was trying to do, at least in the afternoon, took rather longer than I'd expected, and were more difficult. Rather disappointing, given that I'd had rather a productive morning when I managed work out a rather knotty problem and find a rather nice solution. The other was being accused, by my (lovely) wife, of "selective washing up". I think this was a suggestion that I'd not been bothering to do the more difficult or dirty pots and pans, but I was hurt by it, as I'm sure everyone will understand. The day was improved by a) having a pub lunch with Moo and b) having lamb with baked beans for supper. There's something very special about the taste of lamb with baked beans, particularly warmed up roast lamb, and I think God must have known about baked beans when he made roast lamb so yummy. This caused some theological disagreement on my Facebook page, but I welcome controversy. Starck - interesting guy, and amazing designer. There was a good programme on the TV this evening - Design School or similar - about a bunch of young designers battling for the chance to work with him. Very, very interesting. We caught it by accident, but we'll try to watch it again next week. I was in London today, and had a very good meeting with the rest of the team. I'm really, really enjoying the chance to think architecturally and to apply some of the skills and experience I've gained over the past 15 years of work. There's dull stuff, too, but also the opportunity to think and debate with clever colleagues. Good stuff. And it was Jo's first day at school for an entire day. She loved it, and particularly having a school dinner. I'm very keen that she should do this: it will encourage her to eat a wider range of food, it will allow more pupils to eat better food, and I think it builds better social cohesion. So I'm very pleased that she enjoyed it. (backposting) There really was a party today, and after taking the girls to the 1000, Jo got to go to it. It was a family service, and there was lots of standing at the front, singing and doing actions. Much fun, particularly for the girls, but I enjoyed it, too. Miri and I had fun, listening to music, watching a DVD, cuddling, having lunch, while Moo and Jo went to the party. Afterwards, I introduced Jo to festival, an application for Linux/Unix that talks - well, which can be made to speak. Jo had said, a few days before, that of course computers can't talk, and I enjoyed getting it to say things to her. She's also played with lots of words and letters, and I got the my machine to say the words that she was reading. This was very amusing, apparently, and kept people amused for quite a while. I cooked a lovely roast shoulder of lamb, which we had as a family supper. Well, I say _we_, but the girls had very little of the roast potato or carrot or gravy - or even lamb, in Miri's case. Oh well, we tried. (backposting) So, although Jo's ballet went well, there was something of a trauma afterwards. I was given the opportunity to take Jo to a party in the village at 1200. We headed off, with Jo in her Stephanie (Lazytown) outfit. And her silver shoes. Which don't fit her. They really don't. So she fell over and grazed her knee. Quite badly. So, a few tears. But she calmed down and we went into the Post Office. But as we came out, she realised that she was bleeding quite badly. And then we made it to the party venue. It was very quiet. And locked. So I called Moo, and Moo'd got the wrong day for the party. I carried Jo back, and we cleared up the blood. And then we took them to the cinema, just as something to do with them. We watched the vaguely diverting G-Force. I don't think we'll be watching it again, but it used up an hour or so, and was quite enjoyed. And then we went to a local Frankie & Benny's, which also helped. The girls are really, really tired, poor little things. Moo's thinking about this - there's a position free for a parent-governor at Jojo's school. I think she'd be very good at it, and have lots to offer, but it turns out there's an even bigger incentive: the chair of governors has her own yarn shop. Hmmm. We should be suspicious. 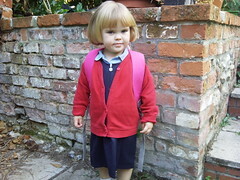 I had to be in London today, but I arranged it so that I got the chance to take Miri to her first day at pre-school. WIth Moo, Mel and Jojo, of course. You're always a bit worried, of course, but she seemed keen, and when the time came, and they opened the door, she fair galloped inside, not waiting for any of us. We had to follow her in to get a kiss goodbye, and she had a lovely, lovely time. Her teachers said she was brilliant and very well-behaved. I then had to head off to London, and did lots of work there, meeting Andi, a mate, for lunch, Simon, an old school-friend for a drink after work, and then Midge, a work colleague who'd brought some stuff I'd left over in the US back for me. Back home quite late, but a good day. Moo's Nan has had a fall this evening, and has had to go to hospital, but it looks like she's going to be OK.
(backposting) Still not getting a huge amount of sleep, but at least the gout is improving. You know when you just _have_ to get a set of work done? Well, that was today. Unluckily, it was for two different pieces of work. But they're both done, even if I wasn't finished before 2000. I also managed to get a haircut, which was useful (what with my hair being too long). And took part in a very interesting discussion on the Eucharist over at Sally's Journey. Feel free to pop over and join in. How tired is Jojo? Very, very tired. And she's only doing afternoons at the moment. But she's enjoying it very much, and getting good at "b" words. That's words with the letter b featuring in them, and the reading thereof. Not feeling great today, and although I drove all the way to Witham station, I got out of the car, walked 20 metres, turned back and drove home (and got the parking fee back). Headache, gout, feeling not good. But got lots of work done, which is something. The gout was somewhat better today, luckily, and I headed off to Halstead church for the 0800. 8 other people there, which isn't bad for that service. I preached on the Messianic Secret, as the gospel reason was Mark 7.24-end. Why, I asked, was there a point in having a Messianic secret at all? Only if Jesus were so obviously a man _first_ to those who met him would it make any sense at all. And although the more extreme emotions - anger and sorrow - are maybe quite easy to associate with Jesus, the gospel reading show him tired, wanting time to himself, telling people not, please not to say who he was, and even maybe a bit grumpy. This helps me to appreciate the humanity of Jesus, particularly as I've been very tired recently. 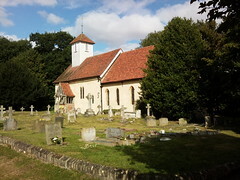 After the service in Halstead, I went to this lovely church in Middleton, deputising for a colleague in a nearby benefice. I preached the same sermon, which seemed safe, and several people said how much they enjoyed it (always nice). In the afternoon, once Nina had taken her two home (Jim had headed off even earlier than me to watch the cricket with Dad), I took the two girls swimming. Jojo managed a whole length (25m) on her own, with which I'm very, very impressed indeed. (backposting) Beset by gout today. Not a good thing, and probably brought on by the cheese, chocolate and red wine last night, so partly my own fault. Jim and Nina were off to a wedding around 1030, and we'd been planning to take the girls and Jim and Nina's kids to a farm or some such, but I really wasn't capable. So Moo took them on her own. 4 of them. Ages: 4, 3, 2, 1. Apparently they behaved very well, but I'm still very much impressed and grateful. I got some more sleep, read through the mortgage extension offer (we're going to have actual, proper radiators installed, to keep the the entire house above freezing all winter this year (hopefully)!) and did some bits and pieces. What a lovely woman Moo is, and I love her very much. Teacher: "whose birthday do we celebrate on Christmas Day? Josephine?" Jojo: "Jesus'. And my friend Sennen's, of course." Ah - and I should have said yesterday that Jojo has decided that she wants the teacher to call her "Josephine", rather than Jojo. I rather like that. At lunch, a friend of Moo's from college, Sophie, came with her two kids. I didn't get to spend much time with her, though, as work was very busy. Good, interesting, challenging stuff, though - the job's working well, I'm pleased to say. Last thing to report on Jojo, a little before going to bed who was rhapsodising about one of her friends - a girl - and how much she loved her. She suddenly came out with "Daddy, girls _can_ marry girls, can't they?" I was really proud, "Yes, Jojo, they _can_." Good for her. Moo and I watched Buffy episodes until Jim (my brother) and Nina (his wife) turned up with their two kids. We got the kids to sleep pretty quickly, and stayed up chatting, eating and drinking till - ooh, well after 11. Really good to see them. (backposting) I've added to photos from flickr as sepearate posts, so you can see how gorgeous she looked. She was so excited, though for this week (all 2 days of it) she's only doing mornings, and next week she's only doing afternoons. Full-time after that, though. I'd arranged to work from home, so was able to take her up to school with Moo, Miri and Mel. There was always the danger of tears, but one of the other mums _was_ crying so we stepped in and cheered her up. Jojo loved it, and it was a real hit. Although when I asked her what her favourite bit was, she told me it was playing on one of the pieces of playground equipment at break-time. .
All proud in her uniform. 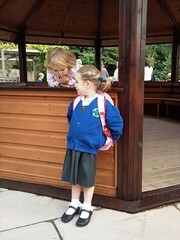 Jojo all relaxed and ready for school, having a chat with Miri. 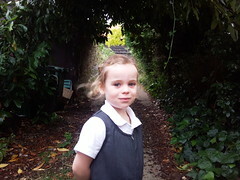 (backposting) Tomorrow is Jojo's first day at school, and to say that she's excited would be something of an understatement. I went to the office today, but as I left home around 0640, I got there nice and early and was easily able to get back home in time to do the girls' bed- and bath-time. More jumping in and out of waves, getting soaked, flying kites. We headed into Southwold for lunch, I bought a couple of shirts for work, we got home, had fish and chips with the girls for supper, and they took about an hour to get to sleep. Oh, well, we're watching more Buffy, as we did on Saturday (did I mention that). We've had a lovely two and a half days. And we could do it again: they're getting really good.